Gloria (Anne Hathaway) is an out-of-work party girl who, after the breakdown of her relationship with boyfriend Tim (Dan Stevens), is forced to leave her life in New York and move back to her hometown. The press notes for Colossal state that this is a film “in which a universally recognisable story is told through a collision of genres that, a priori, is impossible”. You could say that again. For, on the one hand, you have Gloria’s fairly familiar tale. On the other, meanwhile, a Pacific Rim-style monster attacks Seoul. This highly ambitious aim is both the making and the undoing of writer/director Nacho Vigalondo’s movie. After all, he could have easily made a very watchable film about Gloria’s alcoholism without any need for the appearance of Kaiju. However, let's face it, we have all seen that film before (and with Anne Hathaway in the central role). We haven’t (or at least I haven’t) seen a movie that blends this story with the tale of a rampaging monster. So, hats off to Vigalondo for attempting something different - something that really shouldn’t work but, for a while, actually does. Amid the collusion of genres in Colossal, there is also a collection of interesting (if rather on the nose) themes. For example, Vigalondo uses his film to depict the impact of addiction and the widespread pain and suffering it can cause. In addition, he explores the horror of people trapped in abusive relationships. Colossal also examines our reaction to tragic events - particularly those that occur far away from the comfort of home. Vigalondo illustrates how accustomed we have become to watching these catastrophes unfold, gathering together around huge screens and watching rolling news until we feel sated and, all too quickly, move on. 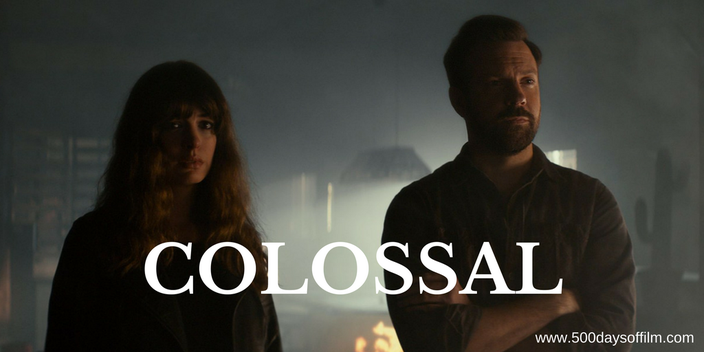 Sadly, however, despite its commendable ambition and impressive performances from both Hathaway and Sudeikis, Colossal cannot bear the weight of its many genres and themes. The film struggles with weird tonal shifts (should we be laughing at Gloria’s antics after the deaths of hundreds of people in South Korea? ), loses its way and starts to implode. As the film started to fall apart, it was only my appreciation for the braveness of Vigalondo’s endeavour that kept me invested in his story. Others, however, were not so patient. If you have, what did you make of this film? Let me know in the comments section below or via Twitter or Facebook!